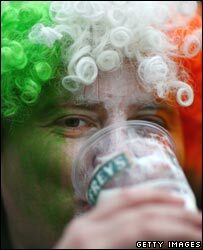 BBC NEWS | UK | Magazine | Why is it 'not' St Patrick's Day today? Why is it 'not' St Patrick's Day today? You may be celebrating St Patrick's Day today as normal, but, at least according to Catholics and Anglicans, you're making a slight mistake. Why is that? St Patrick's Day is on 17 March every year. It's an opportunity for Christians around the world to recognise the life of the patron saint of Ireland. But the feast day is also characterised by parades and boisterous revelry. Traditionally a major event in Ireland, the festival has spread around the world with the movement of Irish immigrants and is now even celebrated in locations like Moscow and Tokyo, which have no significant Irish populations. This year the extremely early arrival of Easter has forced changes to St Patrick's Day. 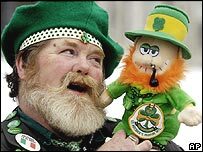 The Catholic Church in England and Wales says St Patrick's Day is simply not on the calendar of feast days this year. This week is known as Holy Week in the church and takes precedence over all saint's days. Any saint's feast day that clashes with it is omitted from the calendar. But the position is different in the Republic of Ireland, where St Patrick's Day was observed on Saturday 15 March, instead of Monday 17 March. Rev Martin Long, a spokesman for the Irish Bishops, said it was a "very, very unusual" step but due to the early Easter, the Church was celebrating the feast on Saturday, two days early. "The reason the solemnity of St Patrick was moved from 17th to the 15th is because it happens to fall this year in Holy Week," he says. "And the liturgy of Holy Week ranks above all others so St Patrick had to be moved to another date. The Catholic Church of Ireland purposefully decided to celebrate it on the 15th so it was as close as possible to the civic celebration, which is on the 17th." For the Church of England, St Patrick's day is celebrated as a "lesser festival" and where that falls between Palm Sunday and Easter Sunday it is normally omitted. But the church's rules allow individual ministers to stage a celebration on the next available day, where "there is sufficient reason". The crux of the problem is the way the date of Easter is calculated, something that has been controversial since the birth of Christianity. In Western churches like those of the British Isles, Easter is taken to be the first Sunday after the full moon that follows the (northern hemisphere) spring equinox. But this is based on a centuries-old method of predicting the full moon (or equinox). It does not absolutely correspond with the lunar cycle. In reality, the equinox can fall before 21 March, but in the religious calendar it is fixed as 21 March. The absolute earliest date for Easter is thus 22 March. Prof Andrew Louth, a historical theologian at Durham University and a Russian Orthodox Church priest, explains the date of Easter is linked to Passover, with the name for Easter, Pascha, marking this in much of the rest of the world. In Jewish ritual, the actual observation of the moon would start the festival, but the complicated rituals of the Christian church required more notice and therefore required a calendar that could predict Easter far in advance, he says. "The answer to why there has been so much dispute is that working things out calendrically is an imperfect art. It is enormously significant if ritual is a very important part of your religion." With the Eastern churches applying a different calculation to Easter, there can be vast differences in timing such as this year when it falls on 27 April. The fixing of a date for Easter is still a massive topic of debate in the global ecumenical movement, but no conclusion has yet been reached. With many countries having public holidays tied to the religious festival, the wide range of movement in the date can cause problems. There was an act passed in Parliament in 1928 to fix "Easter Day" as the first Sunday after the second Saturday in April. But this, despite occasional brief moments of debate, has never come into force. In 2005, speaking for the government, Lord Sainsbury of Turville said: "We have no plans to amend the Easter Act 1928. It remains on the statute book but the act requires that before a draft order is laid before Parliament 'regard shall be had to any opinion officially expressed by any church or other Christian body'. "At this time, the churches have not expressed a desire or willingness to move to a fixed Easter." Here is a selection of your comments. The article is rather misleading in that it implies that east and west have always been divided when in fact it was the new calculation of Easter introduced by Rome with the Gregorian calendar reform which divided our once common date - east and west agreed from the 4th Century up until that point. Of course, for us Orthodox it still is St Patrick's day today, but then I don't believe that we drop saints from the calendar if they fall during Holy Week in any case. Bring the Easter act into force, yes give regard to "the church or any other Christian body", but also give regard to the atheist majority who don't care about the reasoning, but do like their Easter eggs and school holidays at predictable times. Let's be honest: there's no place or right for the church as a minority to have such a strong influence. The working out of Easter goes back to the meeting of the churches bishops with Constantine at Nicaea in about 325AD. Things had been getting a bit mad with each kingdom celebrating Easter on different days and this needed to change. I have the page long calculation needed. I cheated and put it all into a spreadsheet so it is automatic. So, it seems that Ramadan is not the only religious festival that is surrounded by slight confusion, nay anticipation. I feel that religious festivals should be tied to nature rather than following a fixed calender. Makes for an exciting build-up too, no?